When I was a kid, we used hammers and nails to build wooden forts in our yard and we tied long lengths of rope from tree branches to create our own Tarzan swings. We created improvised teeter totters with old wooden planks and beams, and we leaned ladders against trees and created platforms to swing from. Most of our play was risky – vaguely dangerous – and we loved it. Today, in the push to remove all risk and make the world safe for our children, it seems risky play has all but disappeared. Researchers such as Dr. Mariana Brussoni tell us that kids need risky play to develop confidence, resiliency, and essential skills in risk assessment. How can you support appropriate risky play for your child? 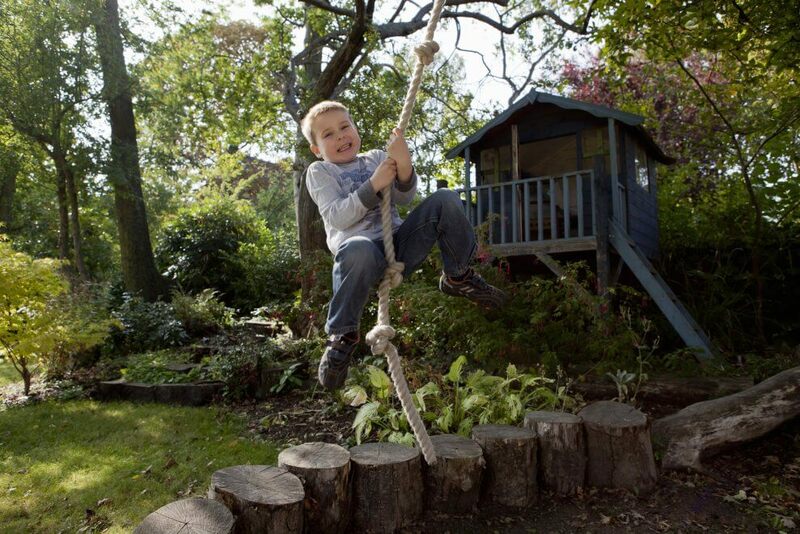 Here’s an idea: build your own backyard risky playground. It doesn’t need to as elaborate as a ninja obstacle course: there are plenty of simple things that you can build with pieces of lumber, lengths of rope, and discarded wooden pallets. Use discarded wooden shipping pallets to create a simple fort. Use one pallet for the floor, three more pallets to create three walls, and one more pallet for the roof. For the floor and the roof, attach additional pieces of wood to cover the gaps between the boards so little feet don’t get stuck. You can use a hammer and nails to attach the pallets, but wood screws are much stronger and more secure. Before you go to buy your wood screws, calculate the lengths you will need and make a shopping list. You don’t want the screws too long, or else the sharp ends will poke out into space and present an unacceptable injury risk. Get an eight-foot length of standard 4×4 lumber and nail short lengths of scrap 2×4 lumber near each end on the same side as cross pieces. (Use a couple of three-inch spikes to nail each scrap.) When you place the balance beam on the ground, these cross pieces hold up the beam a tiny distance, but more importantly they provide stability when kids walk across the beam. But you need the right kind of tree. Large deciduous trees such as oaks, maples, and chestnuts are generally best because they offer a variety of high branches for tying the rope and plenty of unobstructed space beneath their canopy for swinging. On the other hand, coniferous trees such as pines, firs, and spruce tend to have too many branches on the lower portion of their trunks, and these create obstructions to swinging. Make sure there are no fences or other obstructions nearby. If you find a rebounder for a good price, this is a great item to include in your backyard playground. The kids are sure to explore all kinds of novel ways to use it – such as jumping off the fort, or bouncing up to grab the rope swing, or launching themselves over the balance beam. Do you know where you can you find some cut log rounds? (Just Google “log rounds images” if you don’t know what I mean.) If you collect a few, you can stand them on end in your backyard as “stepping stones” as part of an obstacle course. Often you can find log rounds through your municipality if they are cutting up fallen trees after a storm, or you might even know someone who owns a chainsaw and has some log rounds available at their house. As stepping stones, the rounds should stand no taller than half of their diameter. If the rounds are too tall and not wide enough, they will fall over too easily when children walk on top of them, and that presents a bit too much of a falling hazard. You can probably find more things that you can invent or adapt as play equipment for your backyard. For example, large cardboard boxes are great for creating tunnels and secret hiding spaces for imaginative play (just don’t leave them outside in the rain!). See what materials are available and use your imagination! And share your creations with us on Facebook. conditions can change the surfaces of certain materials. What a cool setup! My youngest will love it! With Summer coming I am going to look at setting this up at our cottage!